Youtube seems to be losing some of its early adopters: Coolz0r quits the service, while Nathan even embarks on a grassroots activism mission to ruin the company (by getting its most popular uploaders banned – I have mixed feelings about that one). The issue is: to protect themselves from lawsuits, Youtube is taking the approach of deleting videos and even users upon first suspicion of (copyright) problems. They already received an ultimatum from NBC in Feb, then a proof to Jason Calacanis that it was ‘not a real business‘. Meanwhile the site’s bandwidth costs, which increase every time a visitor clicks on a video, may be approaching $1 million a month–much of which goes to provider Limelight Networks. Industry observers estimate that YouTube, which is streaming 40 million videos and 200 terabytes of data per day, may be paying between a tenth of a cent and half a cent per minute. Neither YouTube nor Limelight would comment on their pricing. I remember the days when a “TB/day” unit of bandwidth sounded like science fiction. Estimations of Youtube’s bandwidth go from 25TB/day to the 200TB/day above. Let’s get a feel for that number. 200 terabytes a day adds up to 6 petabyte per month, or 72 petabyte per year. That’s a lot of Libraries of Congress. It’s equivalent to a sustained 9.26 Gbps stream, more than any single Serial-ATA or Fibre Channel can deliver. If you would build your own distributed network of ‘standard’ unmetered 100Mbps caching servers, optimistically delivering 20TB/month at $2000/month, you would need at least 300 servers – or $600K per month. With Streamload, it’s way more expensive: $4400/15TB or $1,76mio per month for Youtube’s 6PB/month. Although I think Youtube would get a better price since they would need 400 Streamload servers. In Feb 2006 it was only 15 million movies per day, but now the number stands at 40 million. At 2-3 minutes average per video, that’s 100 million minutes per day, or a cumulated 19 years of waisted time per day. There’s probably a GDP loss to be calculated for that too, but that would sound so negative. Amusement has its value. Limelight Networks, YouTube’s content delivery network provider (i.e. the movies come from their servers) reports a monthly income of $4 mio. This means that almost 25% of their income comes from 1 customer. 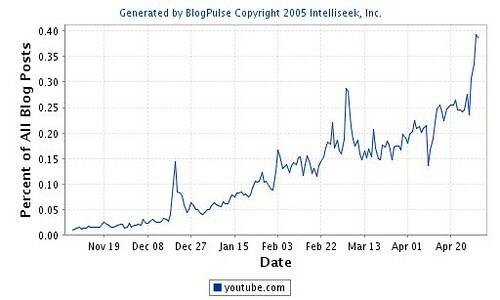 So if Youtube runs through its last $8 mio of funding (around September 2006, say), it will make for a painful quarterly report for Limelight. In the mean time, Youtube is trying to create a better connection with original content creators: the free Youtube Director account. And the best benefit of all? The YouTube Director program is completely, 100% FREE. The only thing we ask? That you be a legitimate, original content creator.
) seems to be uploaded by a director as well. Nice, but violating copyrights. Makes you wonder just how verified the legitimate content creators are. Limelight typically charges $30-40 per mbit/sec of bandwidth. When you’re doing 1gb/sec or more of bandwidth commitments, it’s easy to buy bandwidth for $10-15 per mbit/sec. Youtube is paying a huge premium to Limelight, but they’re effectively outsourcing the technology infrastructure… so it’s probably about on par for what it would cost them to do it themselves. All those “unmetered 100mbit servers” out there can’t actually handle sustaining 100mbit of bandwidth. Usually their upstream only has a 1gb pipe. Those servers are fairly useless for streaming media. Hey Everybody, this was all amazing information and great insight but I am still at stumped. I am putting together an auto enthusiast video blog. Now, in no way am I expecting this to be any where near the size of YouTube, but I called up LimeLight and was stumped by the questions they were asking. I’m putting together startup costs for the first year and can’t find any information on what it would cost to host a video blog and what would be the best hosting option to purchase in this stage. Does anyone have any insight that can help me out? So in laymans terms – if I need around 3000 minutes (3GB of bandwidth) streaming video time per month, what would I typically pay with a company like Limelight? I don’t understand the $30-$40 per mbit/sec typical cost. Bandwidth costs may vary by speed and location and of course every company has different pricing, although I think that bandwidth prices such as T1 will continue to get cheaper. Are you serious? of course bandwidth will get cheaper. It will get astronomically cheaper as pc’s and networks become better. Hey dumb-arse Tomin, if a company was selling at a loss they would soon go broke. The tech dive was years ago. The weeds are gone; for now! Ahh yeah, my point was, dont start a video blog. It has been done. Ever heard of YouTube. They are big coz they are original!! and best. So if I want to open a dating website how much bandwidth should I start out with. How much will I need in a year if it take off slowly. And how much approximately do match.com or the like use????????? I wonder how much bandwidth youtube.com will use everyday when they start streaming in HD? How much video in terabytes does youtube store? Your graph is horribly incorrect, and you should change it. It purports to show (the title of the graph is completely ambiguous) the sustained rate of data transfer per second needed to provide 200 Tb of data per day, averaged over the course of a day. There are 1440 minutes in a day, or 86400 seconds in a day. You have the black bar set (no numbers are given) 1/4 to 1/3 of a Tb/s. In somewhere between 800 to 600 seconds, “a server” would transmit (if it could, of course there is a server farm) the required 200Tb. That’s just 10 to 14 minutes. So the position of your black bar is horribly off. The needed sustained data transfer rate per second to achieve 200Tb a day is 200,000,000Mb / 86400 or 2314Mb per second or 2.3 gigs a second. One gig is of course 1/1000 of a terabyte. So 2.3 gigs is 23/10000 of a Tb. 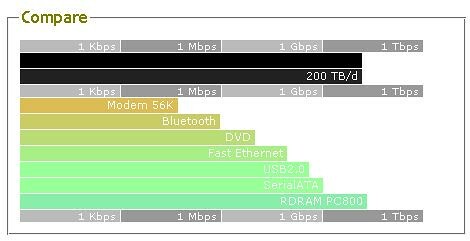 That black bar is not appearing at 23/10000 of the way up the 1 Tb/s marker. You need to redo your diagram so perhaps it tops out at 3 gigs, then draw the black bar a third of the way past the 2 gig mark. You should note that the graph is logarithmic. Since the graph axes are expressed in Gbps/Tbps, the plotted value is 18.52 Gbps, which is at 42% between the 1Gbps and the 1 Tbps mark. i think google and yahoo videos when combined even cannot reach that bandwidth !! the tweney review » Blog Archive » YouTube number one?